OON are proud to be hosting a talk by John Lewis the author of the definitive biography of A.T. Still: From the dry bone to the living man. 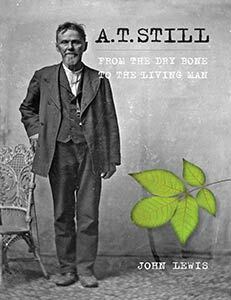 Don’t miss this great opportunity to find out all about A.T.Still’s life and how he saw osteopathy from John Lewis – a man dedicated to discovering the real A.T.Still. Tuesday 12th May at 7:30pm join us as John talks about his book, and the journey that led him to write about osteopathy’s founding father A.T.Still. Andrew Taylor Still had been a medical doctor for ten years when a devastating personal tragedy convinced him to stop prescribing the crude drugs of his day and seek a more effective method of practising medicine. Believing there must be a better way of healing the sick than introducing toxic substances into the body, he embarked on a lifelong quest to decipher the riddles of health and disease, life and death. Combining the latest scientific knowledge with the revolutionary intuition that the body innately contains all the remedies needed for curing, he developed a drugless method of healing effective across the whole disease spectrum.